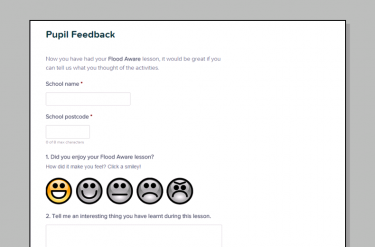 The Flood Aware Schools Pack has been developed for use by primary school teachers with Key Stage 2 pupils, with a particular focus on Year 5. It is designed to inform, educate and empower children and build their understanding and awareness of flooding, and the impact flooding has on communities. The curriculum-linked resources include a Scheme of Work, pupil activity sheets, word glossary, PowerPoint presentation (for class and whole school use) and an Interactive component, which is designed to promote engagement and active learning. Now you have had your Flood Aware lesson, it would be great if you can tell us what you thought of the activities. Click the image to the left to complete the online feedback form. 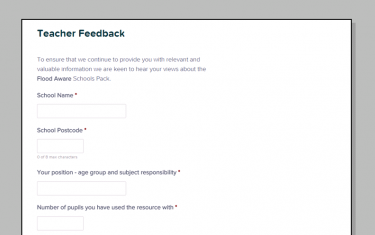 To ensure that we continue to provide you with relevant and valuable information we are keen to hear your views about the Flood Aware Schools Pack.